Colourful woodblock prints - for people all over the world, to hear this phrase is to think of Japan. 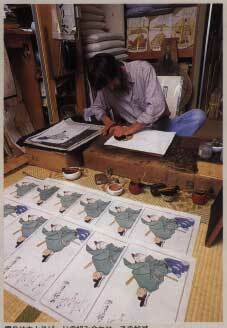 Japan has a long history of woodblock printing, or hanga, originally for illustrations for books. By the late seventeenth century, hanga in the ukiyo-e style came into its own as an art form, and prints came to be appreciated on their own merits. The many woodblock prints that accurately depict life in the Edo period are excellent examples of this tradition. Whether a print of a geisha, a kabuki actor strutting on stage, or even a completely modern image, the woodblock printing technique seems to provide the perfect means of expression to capture the essence of things Japanese. My introduction to Japanese woodblock prints came in a restaurant in Toronto, Canada. It was a place that served okonomiyaki - those Japanese 'pancakes' - and all over the walls were reproductions of famous Japanese prints. Just like most westerners, I thought they were pretty neat, but it wasn't until a short time later, when I saw a proper exhibition of prints in a small gallery one day, that I realized just how interesting they could be. It was at that very moment, standing in the gallery looking at the beautiful colours and soft paper, that my desire to make prints was born. The first prints I tried to make - in 1980 - were of course absolutely awful! I had no idea what tools were used or what materials were suitable, and I had no knowledge at all of how to go about making prints. But the process was so fascinating that I wouldn't give up, and in late 1981 I made a three-month trip to Japan to try and learn as much as I could. When I returned to Canada, I carried knives, chisels, blank cherry blocks, washi paper ... I was ready to go! As you may guess, the prints I made were still terrible! I practiced a lot, and made many prints, but gradually realized that without coming to stay in Japan, I would never be able to do good work in the traditional style, so in 1986 I left my job and brought my family to Tokyo. I visited printers and carvers to get advice and found them to be completely open and friendly - nobody tried to keep secrets from me. With their assistance, and many training prints as practice, I gradually improved my skills to the point where I could make prints of which I was proud. And now, here I am making a living as a traditional-style carver and printer in this 300-year-old field - the only non-Japanese to be doing so. My present work is a series of 100 prints of the famous Hyakunin Isshu, a collection of poems of old Japan put into woodblock form by Katsukawa Shunsho, a latter-eighteenth century woodblock artist and mentor of the even more famous Katsushika Hokusai. I started this series in 1989, and after ten years of steady work, it is now 92 percent finished; it will be completed in December of this year. These ten years have been my 'apprenticeship', after which I will then move on to try and make some prints even more delicate and beautiful. Living as a woodblock printmaker has not always been easy - but it has always brought great satisfaction. To look at one of the prints I have made as it sits on a low table bathed in soft light gives me wonderful pleasure, and when I think that a couple of hundred years from now, somebody will be looking at it as a 'treasure' from the distant past - the long-ago Heisei era - that pleasure is multiplied enormously. I have been making woodblock prints for just about 18 years now, and unlike all other foreigners who are trying it (and there are quite a few of them) I have never had much interest in sosaku hanga. The fascination for me is the smoothly planed wood, the fluffy paper, the pigments being pressed deeply into the surface ... 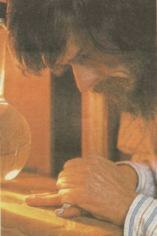 I am a craftsman, an artisan, not an artist. I am not yet a 'master' printmaker, and perhaps I never will be, but to bring such pleasure to the world, and to show people the beauty of Japanese woodblock prints, is enough reward for me.